Nothing says style like a canopy bedroom. 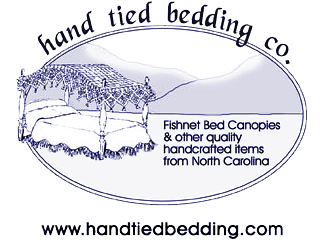 We thought you might enjoy seeing how others are using fishnet canopies in their “CanopyRoom” decorating. The beautiful photos below were kindly provided courtesy of distinguished Bed and Breakfasts. To visit their website, click on the link provided with the room description. 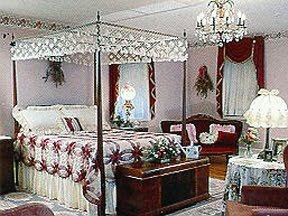 The Magnolia’s Peach room is found at the Liberty Rose Inn in Williamsburg, Virginia. Wallpapered in a vintage floral, this quiet luxurious room has five double hung windows gracefully topped with embroidered lace. Ivory sculptured carpet captures the beauty of mahogany antiques and a Margaret Winston canopy covers the rice carved poster bed outfitted in dark silk & goose down bed clothes. 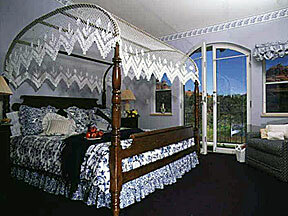 Lizzie’s Room features a Double Diamond canopy. 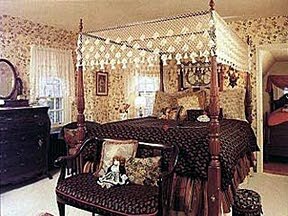 The room is named for Elizabeth Lizzie Rowland who etched her name in an upstairs bedroom window of this featured inn, Edgewood Plantation Bed and Breakfast in Charles City, Virginia. Churchtown Inn in Churchtown Pennsylvania offers their celebration suite. The rose colored room is a soft backdrop for the canopy bed adorned with a handmade wedding ring quilt and Lover’s Knot design fishnet canopy. 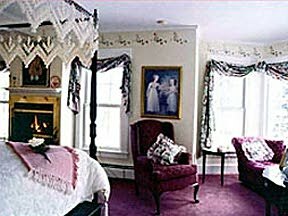 At the Rosewood Country Inn in Bradford, New Hampshire you’ll find the Abigail Adams Room. The large corner suite offers a cozy fireplace and queen size tester bed with Large Scallp canopy. Canyon Villa Inn in Sedona Arizona features the beautiful Manzanita Room, which has a bedside and deck view of the Red Rocks of Sedona, Arizona. 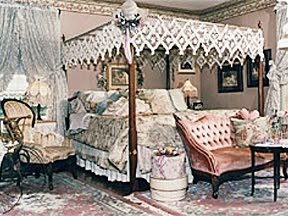 This room features a unique antique reproduction bed adorned with a Large Scallop canopy and bed coverings of soft blues and floral whites. Click on the link provided to visit the Inn’s website.